I have been informed/instructed by Bug about Princess Fiona needing some summer dresses. This is the first one that came out of the sweatshop studio. Bug is of course expecting a couple more. 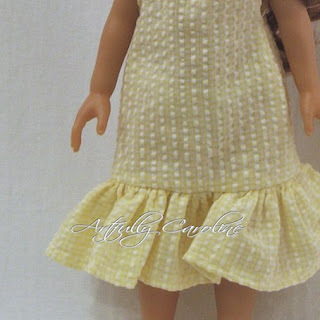 I still had a few scraps of the toile blouse I recycled into a dress for Bug. And for Bug's convenience (and mine) I used a fabric covered elastic instead of a ribbon tie. Easy to put on and off without mommy's help. Bug loves it "Oh! La jolie robe" she went. I think Fiona will get more dresses on the same basic design. It's so cute I'd make some for Bug too but her closet is already full of pretty dresses thanks to Grandma. That's great, and how lovely for Bug to have her doll in a matching dress! I love how it turned out! 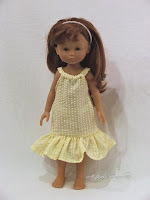 I was just thinking of making a pillowcase dress for my daughter's doll too! But good idea on the elastic! Come link this up at Scrappy Saturdays! You can still link to yesterday's post or link up next saturday! what a lovely doll dress...and girl. Have fun making a wardrove for Fiona! Beautiful outfits! Thanks for linking this post to Share the Love Wednesday! How cute is that! Both are sweet little dolls! wow! so cute! thanks for sharing this to TSWL!